911uk.com - Porsche Forum : View topic - A question about Performance Tyres? Ask the Michelin Expert! 911uk.com Forum Index > Wheels & Tyres > A question about Performance Tyres? Ask the Michelin Expert! Posted: Sun Mar 30, 2014 10:16 pm Post subject: A question about Performance Tyres? Ask the Michelin Expert! For the month of APRIL and MAY 2014, Michelin have agreed to be available to answer your questions on Tyres. 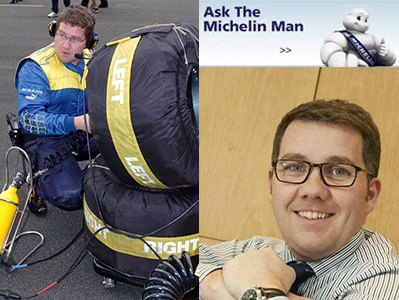 911uk are pleased to announce, that we have the services of Jamie McWhir, Michelin UK Technical Manager, as our "Ask The Expert" on tyres. I run my PS2s at the recommended 36/44 for road use. Posted: Mon Mar 31, 2014 9:41 am Post subject: PS2's for Track day use.. Brand's indy is quite a short lap, but saying that, the one benefit is at least they will be fairly hot on the in lap and pitlane. What we do recommend is that you start the day building up speed on your first runs, check the pressures, and if necessary bleed a little out hot. Repeat this on your next two runs, getting quicker on each run, plus if you build up the temperature of the tyres gradually, the compound is more resilient. by the 3rd run, you should find after that unless significant changes, your pressures remain fairly stable throughout the day. Changing the overall pressures up or down has various effects, lower can help low speed corner exits, but higher normally improves high speed stability. I wouldn't recommend going any lower than 2.0 bar hot (28psi) as this starts to get into the area of potential risks to the tyre on prolonged high speed use. I'd say work on where they feel comfortable, and if the tyres start to feel like they are fading, also remember that the tyre wear and tread temperature have an effect. Also bear in mind if you drive home, then the pressures may need to be readjusted cold the next time you go out for a road run. as the bleeding of hot air, will mean they run lower cold. You can record these cold pressures for that track as a reference point if you then return. WOW! What a starter for 10! Great reply! Now then, N rated tyres.....? Over the years I've used a variety of tyres and struggle to notice any difference between N and non-N rated tyres. Even at the limit on the track I have been unable to produce a difference in visceral feel between the two. Are there any genuine benefits to using N rated rubber over the non-N michelin tyre? Well... "N" rating and general homologation is that $64k question..
And to be honest, a lot of the time, could we feel much difference , probably not..
Ok, so back in the mists of time when earlier 911's were a little bit more tricky to drive, the "n" rating and homologation sometimes gave Porsche and the tyre manufacturers, the ability to tune a product to specifically give the car a type of handling behavior that suited with the characteristics of the car, e.g. it could be a tuned front or rear tyre to re-balance the car. With most homologations, it's a filter process. We will start with a size that the manufacturer wants, and undergo extensive testing, both at our tracks and their own facilities. This will then lead to a direction or correction that will then lead to other solutions being tried, and or developed. From a manufacturers point of view, if we make a specific size and pattern, then tune it away from the "standard" tyre, we end up with a product that needs to be differentiatied from the standard tyre, hence we mark them, "N" Porsche, "*" BMW & "MO" Mercedes for example. The tweaks can be anything from compound to construction to physical size and shape (often to fit under the arch or clear suspension) so the changes can be slight to major. The best comparison is like saying a standard tyre is an "off the peg suit" where as the tuned tyre is "Bespoke tailoring". Hence with an "N" marked tyre, it will have been extensively tested by Porsche and the tyre manufacturer to get the absolute best out of the car and tyre combination. So, whilst we might not feel a huge difference on road or track, normally the "N" rated tyre will always have more potential left in it. There is the odd occasion where a new product will be better, but if it hasn't got that all important "N" rating, its a tough call. Especially if your car is under warranty, as some Porsche main dealers will not entertain a non "n" rated tyre on a car if you have a warranty claim. We reckon that 90% or drivers use only 10% of a tyres potential for 90% of their driving. Interesting answer, thanks. I've just sourced some front PS2s for my turbo but they are MO rated. I go to and from N rated tyres depending upon what I can get them for but always use a premium brand. Michelin being my preferred choice followed by Conti. For my 997, I use the recommended PS2 N2 295/30 R19 rears and 235/35 R19 fronts. However, the door sticker says 40 rear, 34 front and that's what I do and I think a lot of people do. Is it no coincidence that the door sticker pressures are pretty much in the middle of the range Michelin suggests between normal and motorway and is therefore a good all round pressure, or would it be better to try different pressures? I know that sounds like a get out, but let me explain..
normally car manufacturers, define the pressures on vehicles, regardless of the make of tyre fitted. These pressures are normally the ones that give the best dynamic handling (safest) as opposed to pressures for speed, or tyre wear for that matter. Hence pressures are really dependant upon your use of the car. If like me you drive up and down the motorway commuting to work with little load in the car, then standard pressures are more than sufficient. The air in the tyre is simply there to support the structure of the tyre and put load on the carcass to allow it to work. Hence, my advice is the starting point should be the manufacturers pressures. However, if every set of tyres you take off the car suffers from centre wear, the pressures are too high (both shoulders and some polishing of the beads, which is only viewable on stripping the tyre is fairly representative of under pressure). So I would always say, take a starting point of where the manufacturers quote, and try up and down a couple of psi from there to see if you can feel any difference. Always keep the same balance (e.g. if the front is 3psi higher then keep the same differences) and don't really go 10% away from the start point. Likewise, always use a decent pressure gauge, (our own ones are £100 plus that we use) after all you will have it a long time. I don't expect people to have an expensive gauge, but the air line at your filling station is probably displaying a couple of psi out.. hence there is a fair bit of variance. Some decent modern ones are ok. also setting pressures on a cold morning @5C will be different to 25C in July.. Its boyles law where the volume is fixed so the pressure varies with temperature..
Hope that explains some of the differences. Thanks for that, I use a Michelin digital tyre gauge (being a bit OCD) so can be fairly sure the pressures I see are quite accurate. Final question, with balancing ride comfort, handling and fuel economy, I've always thought harder tyres were good for handling and economy but bad for ride. I'm not so sure it's that simple, in fact I was advised that within reason, more pressure is good for all three, even ride comfort, as the tyre will tend to ride over road divots rather than deform into them? Can you help with a question regarding Michelin Super Sport tyres ? My 993 requires a 265/35r18 rear tyre ...the MPSS is available in this size but only in the USA and not in UK/EU ...why would this be the case with so many Porsche owners in Europe ? Is there any chance the 265/35r18 MPSS could be made available in the UK through Michelin retail channels ? Thanks in advance for any help with this question ! Tyre pressures vs. fuel economy, simply higher pressures = lower rolling resistance, as you tend to decrease the size of the contact patch, therefore reducing hysteresis. But compared to other factors vs mpg, e.g. aircon being on or lots of electrical load, its a small factor. sometimes the different tyres on the international market are a confusion and pain..
We in Europe, have been asking for this size to be brought over from America, but the fact it isn't "N" rated has been a small issue. However its also a fitment for other cars (lotus also).. So, short term, e.g. next few months no.. but we did ask for two USA sizes to come across, and they have last year.. so fingers crossed. only other option is we are brining out the PS Cup2 in that size, (and fronts) but it depends on what kind of driving you do. Thanks for coming onto the forum to help with our tyre queries. As a follow up to wfarrell's question. 225/40 ZR18 with 285/30 ZR18 for Wider Body Cars - only available as Michelin Pilot Sport PS2 N3. Whilst the latest 997 and 991 generation cars are able to benefit from the latest range of Michelin Tyres, are there any plans to expand the N rated range of Michelin Tyres available in 18" sizes in the near future to cater for this demand for 911's from 1993 through to 2005. Without going into "deep" politics as to why to date we haven't got homologation for the 991 on Pilot Super Sport, I envisage this should come to pass in 2015, and following that, the back homologation of the PSS onto the older generation cars is planned. Now as a fellow Porsche lover, I'd love it to happen, as it would be a clincher for me to buy that Porsche... I get free tyres! just need the right car to put them on..
We'd like this homologation, as it would allow us to replace some of the PS2 fitments with the new super sports. N Rated 18" PS Cup2's are coming this year in 18", but they depend upon how fast and hard you drive the car. They are more road friendly than the original Cup/Cup+ so not outwith the realms of possibility for some owners. As you can tell by the time, I'm not sat in the office, so I will look at dates on the sizes above tomorrow and get back to you. Running a few degrees of camber has clear handling benefits on track in the corners but what are the actual impact on the tyre and are modern tyres designed to cope with 'some' camber ? Yep, the obvious benefit with some static camber is under lateral cornering, the tyre takes a flat contact patch. GT class Porsche 911's run up to -4 deg rear camber. So, what about road tyres? On the road however, running a lot of static camber tends to wear the inside of the tyre out. It is fairly common to see rear tyres off a 911 with inner shoulder wear. So no track work, I'd say wind the camber as close to zero as the tolerances allow. The wear pattern is the evidence as to how the tyre hits the road. More and more manufacturers are applying higher rear camber and toe, as it calms the car rear end down during lane change manoeuvres, (think elk test), but it has killed rear tyre life.. I have a 993 Carerra 2 running 18 inch wheels. I have previously fitted Michelin PS2 N rated to the car. The car is mainly used for fast road use, with some occasional track time. What tyre would you recommend I fit as replacements (the current tyres are getting old)? I had previously thought of MPSS but from the earlier post it seems like they are not available? Can you shed any light on how tyres are evolved for our older cars? In particular i wondered to what extent the new tyres actually get tested on these older cars as part of their certification. For example, i drive a 1995 993 turbo which uses quite an unusual rear tyre size 285 / 30 R18 ZR N3. This is probably not shared with any of the current range, and yet is surely an advancement of whatever tyre Michelin originally supplied for this model. On "N" rated tyres it's PS2's only, we have no plans at present to back homologate the PSS (pilot Super Sport). 225/40-18 and 265/35-18 PSS are made, but sadly Michelin Europe doesn't currently import the PSS rear from America, where it is made and sold. On the 225/40-18 Front and both rears 265/35-18 and 285/30-18 we launch the Pilot Sport Cup 2, non "N" rated suitable for a 996, but it will be the start of 2015 before these sizes come to market. Therefore a bit away. We can't launch everything at once, as tyre production is always very tight and scheduled, it comes in phases..